A few insects showing migratory behaviour have the capacity to cause widespread economic damage on a life threatening scale. Members of the insect order Orthoptera such as locusts and grasshoppers are the obvious examples but some lepidopterous insects including the caterpillars of various Noctuid moths show these traits. Larvae of Spodoptera spp (the so-called armyworms) are classic examples, with the very name given to these pests i.e. armyworm, illustrating one important aspect of their ecology that allows them to progress swiftly to ‘super’ pest status - gregarious behaviour in which they move around and feed in huge swarms devouring everything in their path. The Middle East, including Western Asia and North Africa, is the focal point of the best known migrant pest, the Desert Locust (Schistocerca gregaria), which has outbreak areas along the Red Sea from where it invades the Arabian Peninsula, Western Asia and the Indian sub-continent. The African Migratory Locust (Locusta migratoria migratorioides) has outbreak areas in the Niger valley of West Africa, from where it threatens the whole of Africa south of the Sahara during plague years, and for Southern and Eastern Africa the red and brown locust are also problem pests. The sheer devastation caused by locusts in plague years tends to overshadow grasshoppers, although these are more perennial pests and cause more damage over the longer term. One in particular (Oedaleus sengalensis, the Senegalese grasshopper), behaves like a locust and causes more damage than so-called tree locusts. Z. variegatus (elegant grasshopper) also exhibits gregarious behaviour and is present throughout Africa. Locusts and grasshoppers are not the only winged pests that attack crops in swarms and which require control programmes combining mobility and flexibility. Growers of small grain cereals are generally accustomed to some losses from birds, but in Africa crops can be ravaged by flocks consisting of hundreds of millions of Quelea birds. The Sunne Pest (Eurygaster integriceps) which primarily threatens wheat crops in the Middle East and Central Asia is not a migrant insect pest. However, the nature of its attack, the extent of damage caused and the difficult terrain where it is traditionally found means that the same level of mobility and flexibility of control operation is required. This sap-sucking bug has the capacity to cause perennial food shortages and millions of dollars in lost crops. Migrant pests need to be controlled rapidly over large (often remote) areas thus ultra-low volume (ULV) techniques are standard, with total application volumes of as little as 0.5 – 1.0 l/ha. Successful use of ULV techniques requires Controlled Droplet Application (CDA) equipment. Micron Sprayers pioneered CDA equipment, including equipment for desert locust control during the plagues of the 1950s, and now manufactures CDA sprayers such as the hand-held Micron ULVA+ and the vehicle mounted ULVAMAST V3 sprayer. 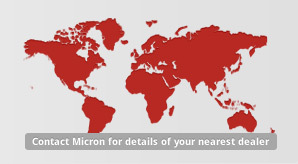 Micron has recently acquired Micronair, recognised as the world leader in the development and manufacture of aerial atomisers for CDA spraying. Micronair also manufactures a knapsack mistblower and vehicle mounted sprayer for migrant pest control (the AU8000 and AU8115 sprayers respectively). With this comprehensive range of CDA sprayers and atomisers for portable, vehicle-mounted and aerial spraying, Micron Sprayers is in the unique position of being able to supply the full range of spray application equipment required for migrant pest control programmes. Micron’s latest ULVAMAST V3E sprayer combines the uniform-small droplets and performance characteristics of previous ULVAMAST models with state of the art electronic control to give unrivalled accuracy and safety, with a liquid closed transfer system option available. The in-cab controller on the ULVAMAST V3E, with atomiser speed settings and choice of ten pre-set flow rates from 0.2-1.5 litres/minute, can eliminate the need for the operator to calibrate the system – whilst a simpler ULVAMAST V3M with manual flow control is also available. The ULVAMAST V3 has been extensively tested in both research trials and field scale operations throughout Africa, the Middle East and Asia. The Micronair AU 8115 vehicle mounted sprayer adds air to help move spray away from the spray vehicle and can achieve larger swaths and a greater effective release height. The hand-held Micron ULVA+, the twin mode ULV/VLV (ultra low volume/very low volume) CDA sprayer used throughout Africa for crop protection, offers a complementary sprayer to the vehicle-mounted ULVAMAST V3 and the capability of village level control operations where smallholder farmers protect their own crops, with the Micronair AU 8000 knapsack mistblower sprayer suitable where dense canopies, including trees, need to be penetrated. Improved accuracy in application is now also possible using GPS (Global Positioning System) which affords accurate identification and recording of the area that has been sprayed. Micron and Micronair sprayers have been widely used throughout Africa since the last outbreak of the desert locust started in the late 1980s, and have also been used against red and brown locusts. 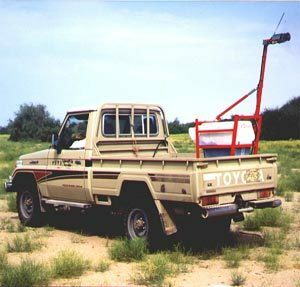 The Ulvamast has been tested by both the UN FAO against desert locust and by the South African Plant Protection Research Institute against brown locust, and been found to be the most efficient vehicle mounted sprayer available. The years 1999 and 2000 have seen large outbreaks of locusts in Central Asia. Micronair aerial atomisers (AU5000) and ground sprayers (AU8000 and AU8115) together with the vehicle mounted ULVAMAST sprayer have been supplied to this area in collaboration with some agrochemical companies to ensure that the most up to date technology is available for controlling these outbreaks. The equipment has been used to spray conventional insecticides and IGRs (insect growth regulators) in large scale treatments - with 8m hectares treated in 1999 and the total infestation area for 2000 estimated at 5m hectares. Crops affected include sunflower, peas, potatoes, wheat, barley and maize. The Ulva, Ulvamast and Micronair AU8115 are also recommended for use against African armyworm (Spodoptera exempta) in Eastern Africa, and are being used to combat the latest outbreak. Comprehensive information on the African armyworm was collected by DLCO-EA in their Regional Armyworm Programme and the resulting key text on this pest, 'The African Armyworm Handbook', has just been revised and updated (by the UK Natural Resources Institute, funded by the UK Department for International Development). East Africa is currently the focal point of a potentially devastating outbreak of armyworm. The Tanzanian Government has instructed agrochemical dealers to import and stock insecticides including diazinon, fenitrothion and chlorpyriphos and the Ministry of Agriculture estimates that some US$ 1 million will be required to control the outbreak, double the original forecast of pest control costs for 2001 - with fears that infestation will spill over into the neighbouring countries of Kenya, Malawi and Zambia. The Quelea birds including Quelea quelea quelea (red billed weaver bird) in West Africa and Quelea quelea aethiopica in East Africa are responsible for huge losses in cereal crops such as rice, sorghum and millet. Carefully planned and timed control programmes are required using ground spray machines or aircraft to spray roosting or nesting sites. Ground spray machines such as the Micronair AU8115 can be positioned upwind of the site in the evening and used to drift spray droplets into the trees as the birds return to their perches or nests. Alternatively, ground sprayers such as the Micronair AU8115 or AU8000 or aircraft with ULV spray equipment such as Micronair AU5000 atomisers can be used at dusk after the birds have settled. The sound of the sprayer or aircraft disturbs the birds and they then collect chemical by flying through the spray cloud. Large scale control operations against Sunne Pest in Central Asia have been undertaken using Micron equipment in the last decade. Projects funded by the UN FAO and the UK DFID (Department for International Development) deployed thousands of ULVA+ sprayers in Iraq and Afghanistan. These hand held sprayers offer logistically and economically viable means of Sunne Pest management in inherently difficult terrain, in control situations where these difficulties were compounded by political upheaval and war. In Turkey recent spraying operations against Sunne Pest with the ULVA+ have been so successful that the government is considering replacing part of the aerial spraying programme with use of the ULVA+. Until now spraying operations against migrant pests have used a variety of traditional pesticides. These provide a rapid kill but tend to be non-discriminatory in action, damaging populations of natural enemies and posing potential threats to farming communities and their livestock. Use of novel pesticides, such as IGRs, is now becoming widespread and, more recently, various biopesticides have been developed based on entomopathogenic bacteria, viruses and fungi and semiochemicals. Use of biopesticides against both locusts and armyworm has been increasingly researched during the last decade. 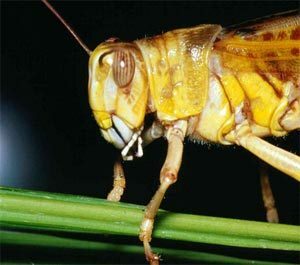 A new novel biopesticide for locust control, 'Green Muscle', is now commercially available following many years of field testing. This is based on the entomopathogenic fungus Metarhizium anisopliae. Evaluated thoroughly in both the Sahel and South Africa using Micron and Micronair equipment and recently sprayed on a large scale for the first time in Niger, ‘Green Muscle’ is proving to offer longer lasting control than previously used traditional insecticides. Unit cost of spraying ‘Green Muscle’ is approximately the same as that for traditional insecticide (less than US$10/hectare) but overall the costs are almost one third less because the fungal formulation only needs to be sprayed once per season. The development and uptake of ‘Green Muscle’ demonstrates the new opportunities for environmentally benign application to control important migrant pests. Dr. Lucas Brader, Director General of IITA (International Institute of Tropical Agriculture), part of an international consortium called LUBILOSA (LUtte BIologique contre les LOcustes et les SAuteriaux), who has been involved in the development of biocontrol of locusts believes Africa is now overdue for its next locust and grasshopper invasion. “When they strike”, Dr. Brader has stated, “control costs are likely to escalate rapidly to US$500 million. For this reason”, he says, “we are proposing a pre-emptive strike at the locusts in their breeding grounds. By using ‘Green Muscle’ in this way we will catch immature locusts (nymphs) before they are mature enough to fly and become a threat to farmers’ fields over a large area. The cost, though significant at US$15 million annually, will be a fraction of that required to try and manage a full blown outbreak and invasion”. The only way to manage a migrant pest is to match its mobility. CDA spraying allows a rapid targeted response to be undertaken over large, and remote, areas. With the assistance of new GPS technology migrant pest control can become yet more efficient and better recording of operations can be undertaken. CDA, allied with use of GPS technology, together with the development and use of safer, cheaper and more durable chemicals based on naturally-occurring biological control agents, offers new ways to control an age old problem.